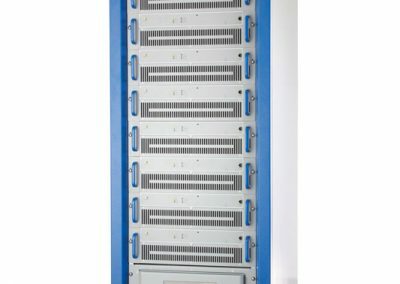 Digital, Analog, and Dual Cast TV Transmitter FUTURE SFT Series is reaching the highest technology level in both TV Digital Signal Processing and RF domain. 1) ARK-X: the new evolution of the ARK Series multistandard DTV Drivers, the ARK-X Series, able to meet or exceed all the DTV International Broadcasters requirements. 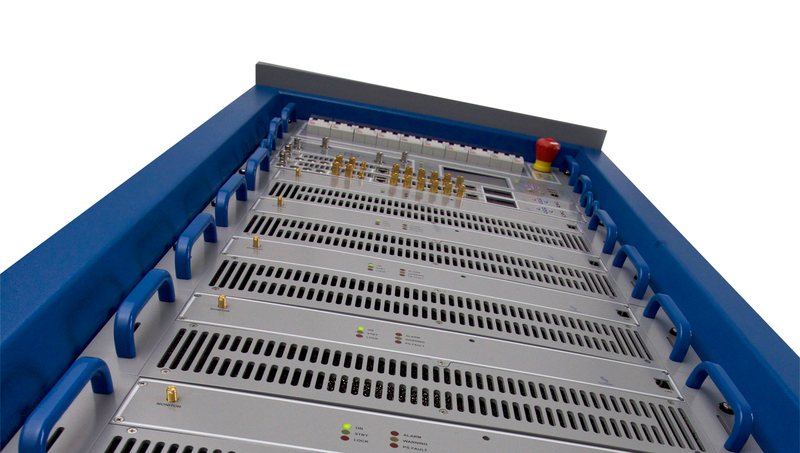 The improvement of digital adaptive precorrection and configuration flexibility are the key points for this advanced product, developed by the excellent Screen R&D Digital Signalling dept. 2) Latest generation LDMOS devices: more rugged and efficient compared to the past, with a special low-loss design of matching and combining system, together with extremely high-efficiency power supplies (over 96% efficiency). 3) Compactness: a new concept of heatsync and ultracompact power supplies grants the minimum sizes of amplifier modules with air cooling or liquid cooling systems, and a greatly reduced dimensioning of the cooling system itself. 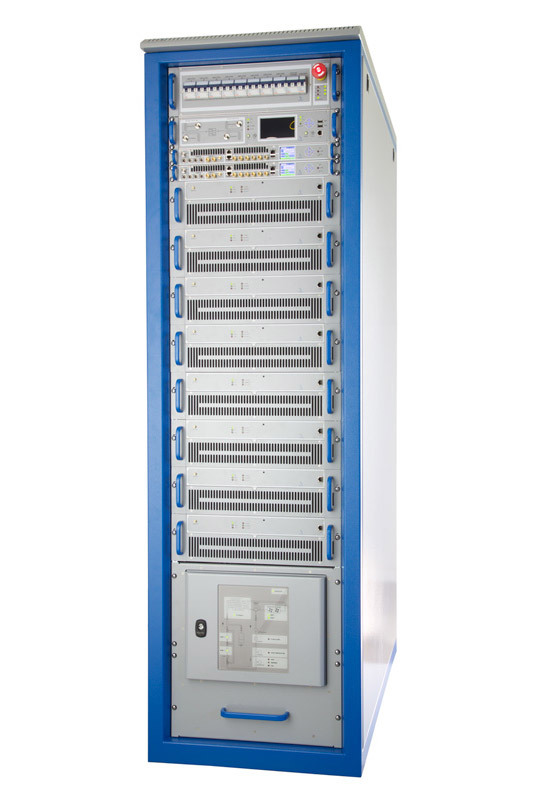 A 10 kW rms DTV Transmitter in a single rack is just an example of this extreme compactness. 4) Easy and Fast maintenance: Screen Group’s 25 years’ experience allowed for designing this new FUTURE SFT SERIES with a significantly improved easy-maintenance concept. All RF power modules are hot pluggable (both liquid and air cooled versions) for an easy bench testing and/or instant replacement on site. All RF power modules are equipped with 3 independent power supplies for maximum redundancy and easy single phase or balanced three phases operation selection. These 3 power supplies are also hot pluggable themselves, for a unique way of smart maintenance. 5) Smart System Design: latest generation progressive RF combiner with ultracompact unbalancing dummy loads and a smart intercommunication interface between RF modules, drivers and Logical Control System allow for a very clean and easy to maintain system configuration both for liquid and air cooling equipment. TV Transmitters FUTURE SFT Series is the result of Screen’s R&D intense activity on High-Performance RF Amplifiers, combined with the new widely improved software precorrection capability and very efficient power supplies (>96%). TV Transmitters FUTURE SFT Series features a built-in SFN adapter and very advanced SWDT® (Software Defined Transmitters) technology, that allows implementing different modulation patterns – either digital or analog (DVB, ATSC, ISDB-T, DTMB, DAB, DAB+,T-DMB, ATV, etc.) – in the same hardware. – or even via a dedicated command inserted into the transport stream. Functional interfaces are available for complete remote control of the transmitters by serial protocols or TCP/IP ports, thanks to the internal Web server or built-in SNMP.